What are progressive profiling and on-site retargeting? Although these two techniques have a lot in common and are, in some ways, two sides of the same coin, it’s important to distinguish what sets them apart. Progressive profiling, in a nutshell, is the act of building up a more complete picture of who leads are by gathering more information about them after they have filled out an initial form like an email subscription signup. On-site retargeting, on the other hand, involves changing the calls-to-action that website visitors see based on the information that you have gathered to date, such as what calls-to-action the visitor has already converted on and what information you have on the visitor. 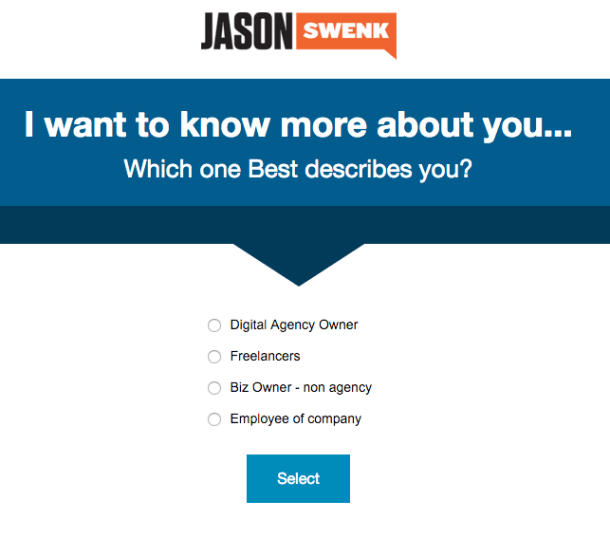 The better job you’ve done of progressive profiling, the more relevant a call-to-action you can display. Marketers these days use data to do all sorts of smart things. And yet, there are still untapped strategies for leveraging data to deliver more effective marketing and convert more sales. For most, the combination of progressive profiling and on-site retargeting are a good example. Your calls-to-action are static and take up valuable real estate on your website when they are no longer relevant (ie, after someone has already converted on them). If someone has already subscribed to your blog, why keep asking them to subscribe to your blog? You could be promoting a next step that will pull them further down the customer acquisition funnel, like promoting a webinar, chatting with a sales rep, or signing up for a trial. You create a negative user experience when you try to cram all the information you want to obtain from a website visitor on one form – decreasing conversion rates. 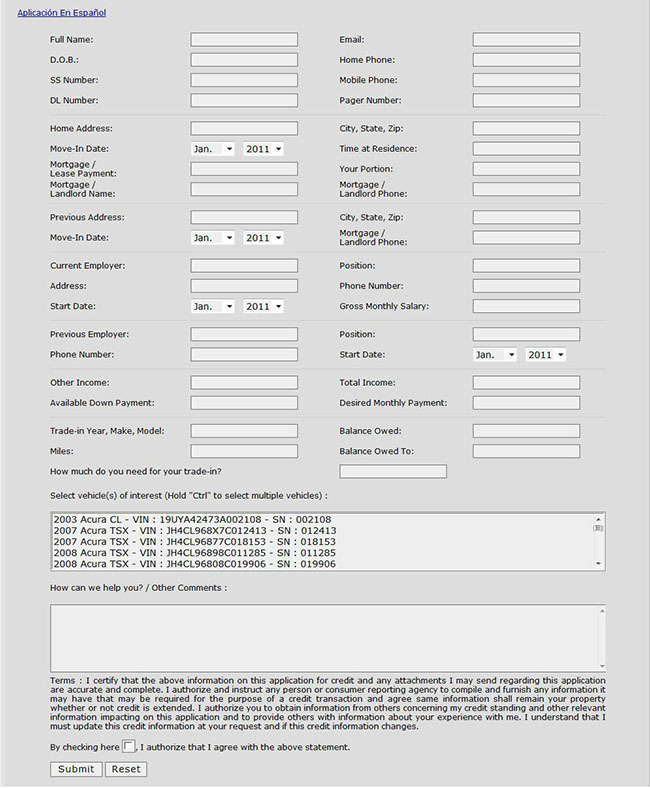 What are the chances that you’ll fill out a form like the one below vs filling out a form that asks for the same information, but over multiple steps? I’d say pretty slim. The best way to understand the power of this lead nurturing combo is to see a lead nurturing journey that uses both progressive profiling and on-site retargeting. A visitor has subscribed to your email list after reading a blog post that they found particularly useful, but still doesn’t fully understand exactly how your product/service can help them. Action: Next time the visitor returns to your site, replace the blog subscription form on your site with a call-to-action to sign up for your next webinar, that also asks for their name. Jack (the visitor) attends the webinar, in which you mention an extended trial or discount code for attendees, and is starting to see how he might use your product. Action: When Jack comes back to your site after attending the webinar, prominently feature a call-to-action to sign up where this deal will be applied automatically. There are plenty of tools out there that can help with progressive profiling – Eloqua, Hubspot, Marketo, etc. – but they tend to be costly, or focus more on either progressive profiling or marketing automation, rather than on-site retargeting. 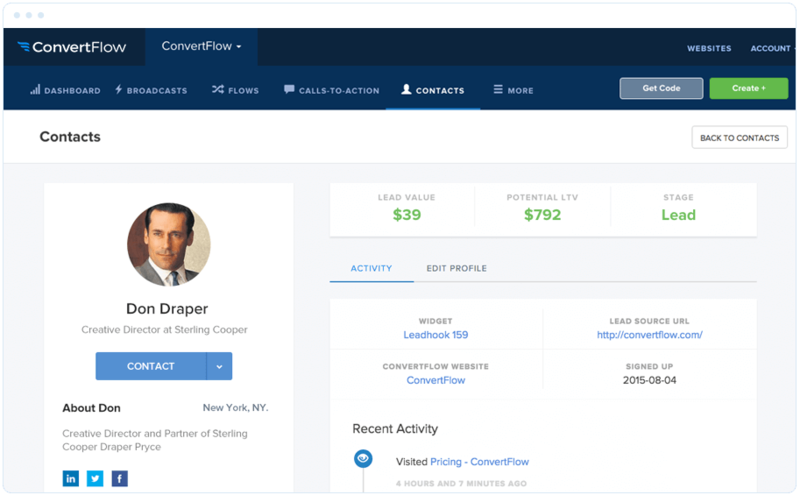 ConvertFlow, on the other hand, is an affordable option that combines all three, allowing you to build up detailed profiles of your website visitors to fuel effective on-site retargeting campaigns. Jack is impressed with how things have gone during the trial, and got a lot out of talking with one of your team members, and decides to convert to a paid customer. Using progressive profiling, it’s possible to build up a clearer picture of prospects. Above, we learned that anonymous visitor #376842 is actually Jack, a small business owner who’s short on time, but appreciates a helping hand when setting up new features. Jack sees on-site retargeting in action each time he visits the website, and continually participates in progressive profiling as he converts on each subsequent call-to-action, and submits new information on himself and his company. Chances are high that you’re wasting space on your website that could be used to move someone along your customer acquisition funnel; turning a recent email subscriber into a qualified lead, and eventually into a paying customer. 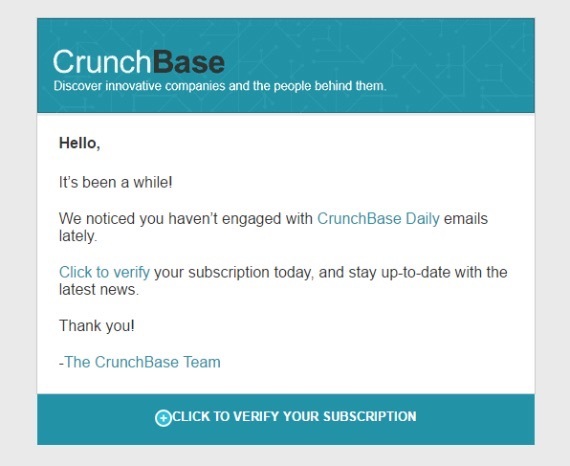 Every time you show an existing email subscriber a blog signup form or a current trial user an invite to sign up for a trial, that’s exactly what you’re doing: wasting valuable real estate. On-site retargeting is the answer to get these returning visitors to take the next step. And if you want to qualify leads or your sales team is begging for more lead intelligence, progressive profiling will help you improve conversion rates AND get more information on leads over time. The real power of these lead nurturing strategies is evident when you use them together. 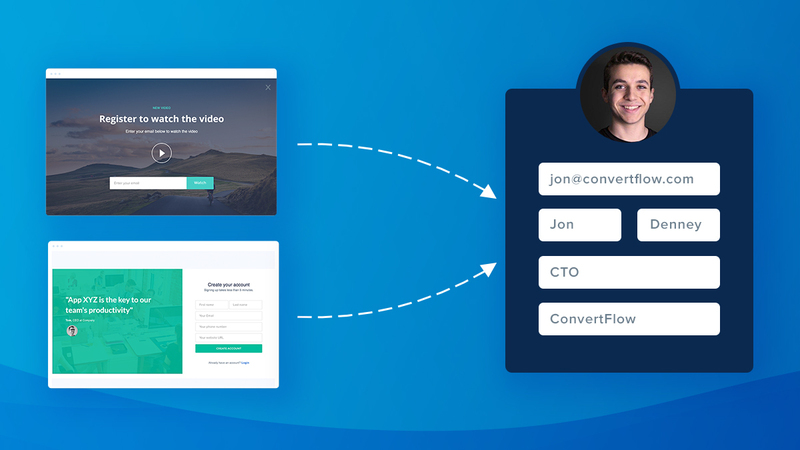 Give this powerful strategy a try with ConvertFlow – It will only take a few minutes to setup, and you can get started for free! By asking for information over a longer period of time, you build a more complete picture of users and visitors without creeping them out, or sacrificing conversions. Plus, you can then use that information to automate more relevant calls-to-action (on-site retargeting), and trigger more effective marketing and sales messaging over time. Jack has logged into his account three times but hasn’t really done much with his trial yet. Now is a great time to show him a video of how to get started and make the most of the product. Action: Ask Jack a little more about the company he works for – is he self-employed, running a business or an employee at a much larger company? Jack’s trial is one day away from ending. And while he’s used your product a few times, it doesn’t appear likely that he’s going to convert. Action: Give Jack the option of extending his trial when he next visits the site or, if he has the time, jump on a call for a conversation about how you can help him.